We recently began a multi-year research study examining how bryophyte specimens are stored and organized at scientific institutions across North America and Europe and how (if at all) herbarium curation methods/approaches affect research in our research community and the study of bryophytes in particular. We estimate that it will take between 20 and 40 minutes to complete our survey. Should you want to review the questions and prepare your answers before beginning the online survey, a digital copy of our full survey is available here: https://tinyurl.com/y858qlbx. Participation in this study is fully voluntary, and you will not be compensated for completing our study. Should you decide to complete our survey, consider including your email address on the last page of the survey so that you are entered into a drawing for a free pair of natural history books. Further details on our study and its objectives and the rights and responsibilities of study participants are included on the first page of the survey. Thank you for your time and assistance! We look forward to sharing our findings with you at a later date. Hanging out with botanists in the field is a great way to learn more about plants and their identification. I recently spent a few days with some awesome botanists in Tennessee at the annual Spring Wildflower Pilgrimage in the Smoky Mountains National Park. We looked at wildflowers, trees, shrubs, ferns, and of course mosses. There are also walks for the animal-lovers focusing on salamanders, wild hogs, birds, and bears. A funny anecdote is that the bear walks hardly ever see bears, though you will learn a lot about them on the walk. You are more likely to see a bear driving to a walk or on a walk about wildflowers. That is one of the reasons I like studying plants. They don't move on the landscape nearly as fast. Next year's Pilgrimage will be held April 11-15, 2017. 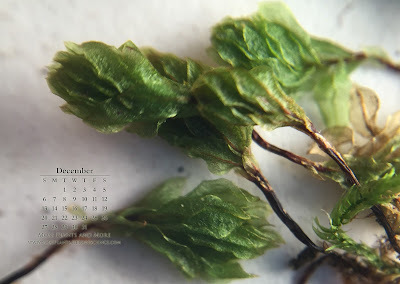 But if you can't wait until next year to get out into the field to learn some mosses there are courses and forays happening this summer and fall in Maine, Ohio, and Quebec. For more information on these and other outdoor moss events check out this updated list. If you know of any others I should add to the list drop a message in the comments and I will add it on. A friend of a friend sent me these lovely photos of mosses from Bath, England to identify. So, where do we start? Well, I usually start with the features that look the most distinctive and sift through my mental card catalog of mosses to see which ones these fit. 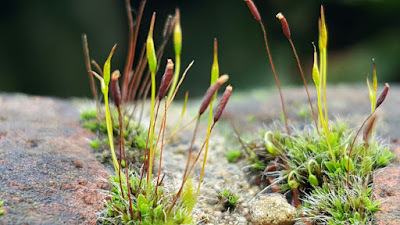 Sporophytes can be helpful for determining the higher classification for the moss, such as the order or family. 1) The peristome teeth look to be made of many narrow filaments that are twisted at the apex, which = Pottiaceae in my mind. Now we get to the more difficult part of moss identification. Trying to get lower than family or genus from just a couple photographs. What else can we see. 2) The leaves are topped by long, white awns. 3) Some of the leaves are folded inward. 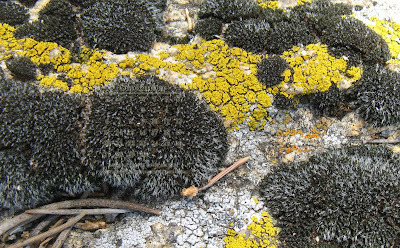 4) It is growing on rock or concrete. My tendency is to go with a common species that doesn't contradict the observations we can make from the photos. So my initial thought for this one is Syntrichia ruralis, but that is a species I know from North America and we know this photo was taken in England. So, does Syntrichia ruralis grow in England or do they have different Syntrichia species we should consider? Off to the British Bryological Society's Online Field Guide. They have 13 species/subspecies of Syntrichia listed. They have two subspecies of Syntrichia, but both of them say that capsules on this species are rare. And this specimen has a lot of capsules. So I'll flip through some of the species and see which ones match. They also have great maps in the corner so I pulled up the location of Bath to see if that would help narrow the search. There are a few that look close, but none that give me that gut feeling of yes we have a match. The awns in the descriptions/drawings seem too short compared to the photos. They look to be at least 1/2 the length of the leaf lamina in the photos. So let's take a step back. A lot of the Syntrichia species were formerly in the genus Tortula, which is also in the Pottiaceae. Let's take a look at some of the species in that genus. Most of the Tortula species have small awns or are lacking them, except for Tortula muralis. Check the description of this species out to see what you think compared to the photos. Nothing from the description is in contradiction to what I can see from the photos. It also points out that Syntrichia species are often larger and the photos look smaller, more similar to the Tortula in size. I think we have a winner! Tortula muralis is my ID for this species based on the photos and the British Field Guide. What do you think? Would you give it a different name? If you are familiar with mosses from the eastern United States you may know the moss Rhodobryum. The rose moss, pictured on the right. 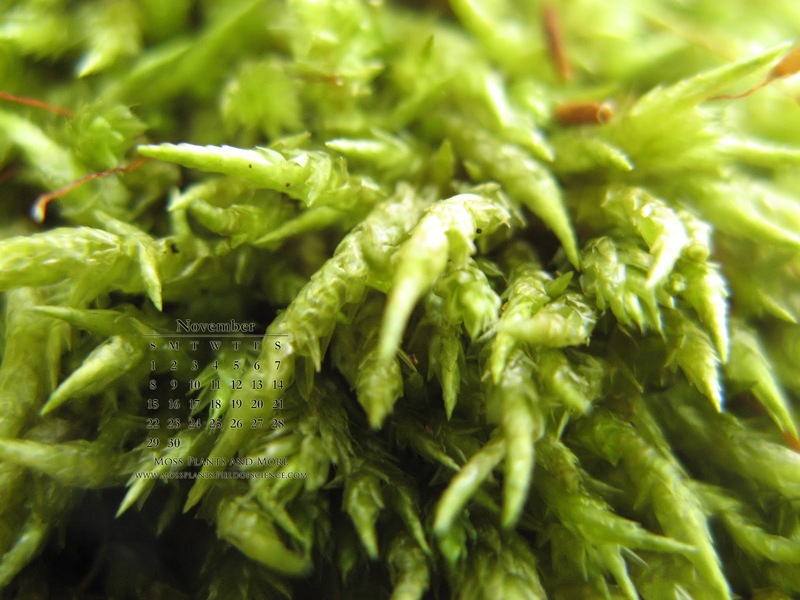 It is a large, easily recognized, and charismatic moss that grows in forests. And I am in agreement with its name. It does look like a rose with many lush, green petals. So when I came across the moss below you could imagine that my initial reaction was that it looks like Rhodobryum, which is close but not correct. Rhodobryum does not live in California. It lives in the central and eastern US. It is Roellobryon. Rhodobryum, Roellobryon. You see where the confusion could arise. Not only in the name, but in the similarity of the plants. One of the main features that distinguishes Roellobryon are the rugose leaves. This was a new term for me so I turned to my handy moss glossary and here is what it said about rugose. The photo that is included with the definition does a really good job of illustrating the wrinkly nature of the leaves. Unfortunately the specimen that I was looking at was not very wrinkly at all when viewed under the compound microscope. The wrinkles that I did see looked to me just from the leaf being squashed under the cover slip. Not nearly as many wrinkles as shown here. But that happens. Variation across/among individuals. Biology is messy like that. Alternatively it may be that the rugose nature of the leaves is more visible on the dried samples, rather than wet ones under the microscope. I always enjoy making new species friends and this one was especially fun to meet. Keep an eye out for them when you are in California forests. They like to hang out on the humus underneath trees and shrubs. You never know when you might bump into Roellobryon. Do you know this moss? After our run-in at the herbarium last week we are besties. Stay tuned for a post later in the week about my mossy adventures with this character. 3 - If the image does not fit your desktop neatly, you may have to adjust the image (Mac: System Preferences - Desktop and Screen Saver - Desktop; Windows: Control Panel - Display - Desktop) and choose "Fill screen" as the display mode of your background image. 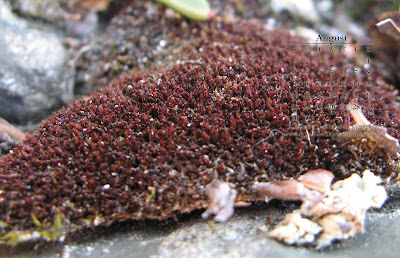 Moss spores are small single celled packages that play a crucial role in establishing new populations. 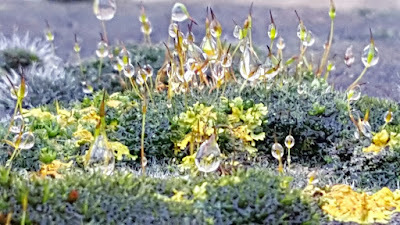 These tiny units are blown by the wind and then landing somewhere suitable, grow into a new moss plant. 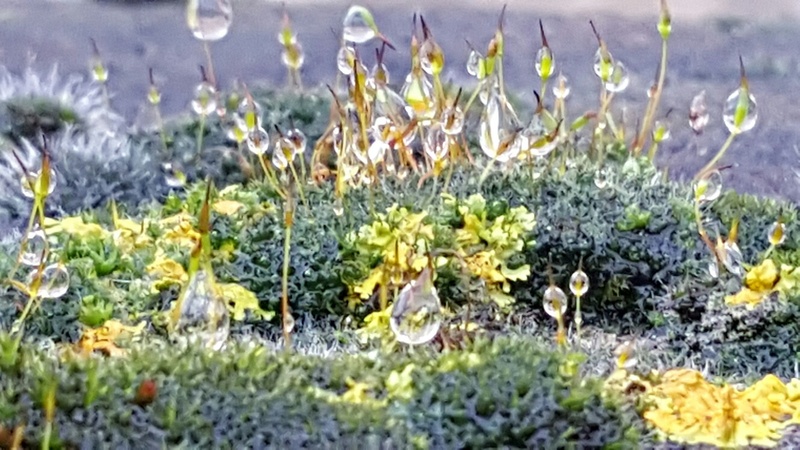 They enable mosses to spread far and wide across the globe. There are two strategies for releasing spores. Xerochastic = capsules are open and spores are released when conditions are dry. Hygrochastic = capsules are open and spores are released when conditions are wet. We might expect to that plants with different strategies for spore release also have different types of spores. Maybe those that are released during wet conditions are primed to develop more quickly and those released when it is dry have more long-term energy storage to increase their survival until conditions are good for growth. In a recent study, Nagore Medina explored the question of whether spores have different characteristics between those that have xerochastic vs. hygrochastic dispersal in seven closely related Orthotrichum species. 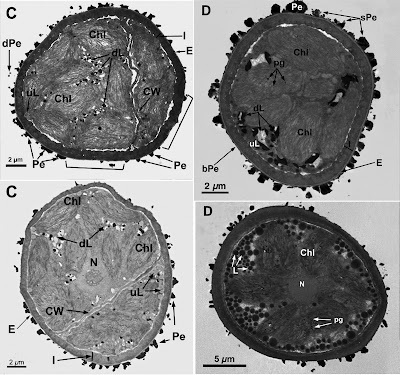 She used Transmission Electron Microscopy to examine the spore ultrastructure to determine if there were any differences between the species. She found that the two hygrochastic species that disperse when conditions are wet have slightly smaller amounts of lipids inside. Think of the lipids as fat storage that helps the spores make it through tough times when they are not producing new food. This points toward these spores being less prepared to survive long-term out in the world prior to growing. Also the hygrochastic species have higher proportions of bicellular spores. Usually spores are just a single cell, as I mentioned earlier, but of course in biology there are always exceptions to the rule. Life is gloriously messy like that! They interpret the bicellular spores as a sign of early germination. Think of these spores being ready to hit the ground growing. They are so prepared that they already started dividing to produce more cells. Examples of this spore difference are visible in the images below. The two on the left have bicellular spores. There is a thin line running through the middle of the spore labeled "CW" indicating where a new cell wall has formed separating the two cells on either side. The spores on the right are each composed of only a single cell. From Medina & Estébanez 2014. 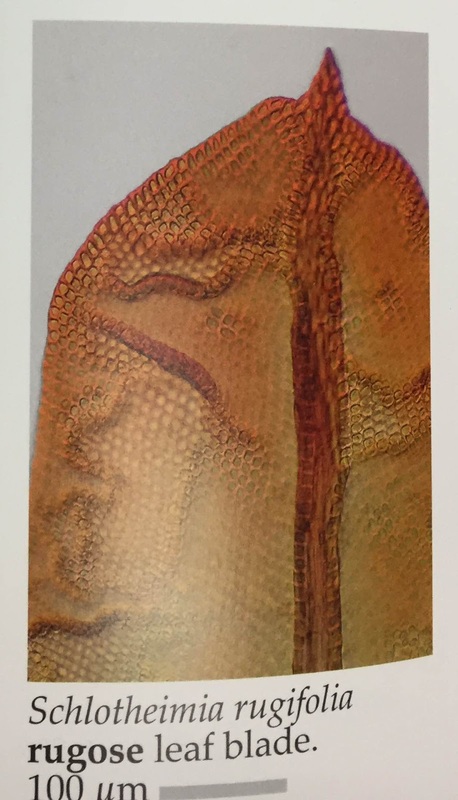 Transverse sections through the spores. Two hygrochastic species on the left. Two xerochastic species on the right. Upper Left: Figure 1C. Lower Left: Figure 4C. Upper Right: Figure 6D. Lower Right: Figure 7D. These are the main differences that they found between the spores of hygrochastic and xerochastic species. Unfortunately no other significant differences were found between the spores. But that is how it sometimes goes with science. Scientists come up with an interesting hypothesis that predicts a particular pattern and you find a bit of data supporting your prediction, but not nearly as much as you had hoped to make a very strong conclusion. Instead there is a bit of evidence supporting your idea, which may be just enough to keep you trying out the next experiment to see where the explorations will take you. Nagore G. Medina & Belén Estébanez. 2014. Does spore ultrastructure mirror different dispersal strategies in mosses? A study of seven iberianOrthotrichum species. 9 (11): e112867. The name of this moss describes some of the features that make this species easy to recognize. 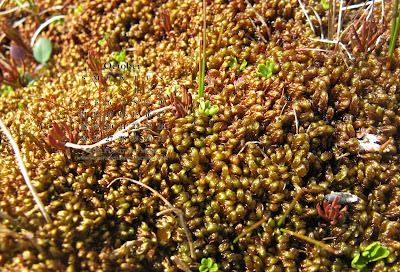 It is the moss Acrocladium auriculatum. If we break down the name the genus means "acro-" = tip/apical + "-cladium" = branch, which describes the highly pointed branches tips. The specific epithet describes the heart shaped leaves; they are shaped like two earlobes at the base ("auricul-" = ear/earlobe). This species is native to southwestern South America and I came across it during my travels this year to Chile. It always amuses me when I bump into bryophytes when reading, especially when it is my recreational fiction reading. 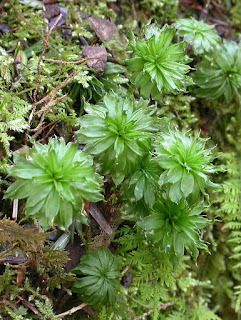 It is pretty common for mosses to be described as part of the background scenery, such as 'The lush verdant forest was covered in a layer of soft moss'. Mosses are also used as part of a survival strategy either as an insulating layer to keep warm or an absorptive padding to pack a wound. Using mosses for wound care is not a fictional idea, but was actually a practice in World War I. Sphagnum mosses are highly absorptive and have antimicrobial properties, which make them ideal for this purpose. But I digress. I could go on, but I think you get the idea. Taking the moss life cycle into a visual format using people could have made for some great imagery. Instead you can check out the video here for a take on the life cycle with all the stages explained. If you are in to post-apocalyptic tales I would highly recommend the MaddAdam trilogy for your next literary adventure. Another moss from my trip to southern Chile this past January. Unfortunately I don't have an id for this one. If anyone has any thoughts on a name for this moss, drop me a message in the comments. from the 2015 SO BE FREE moss foray in the San Bernardino Mountains of California. This past January I attended the 2015 conference of the International Bryological Association in southern Chile. It was a great conference and an amazing location to visit! 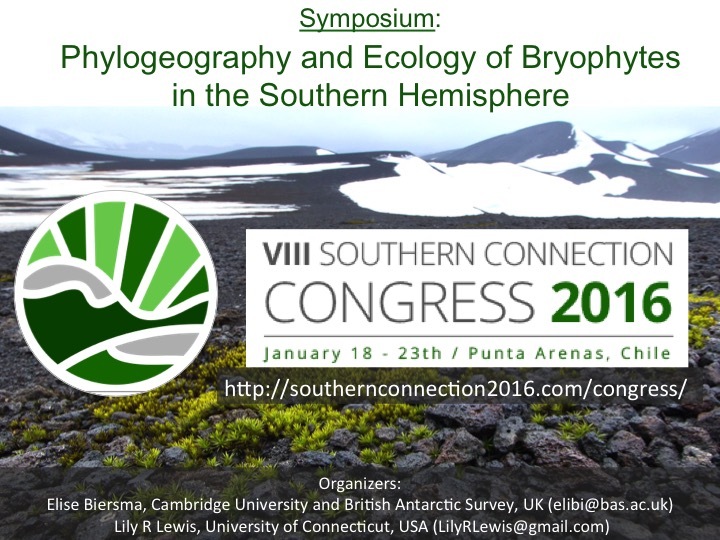 The symposium advertised below may only be of interest to professional bryologists, but I would highly recommend that anyone looking for a far off vacation adventure that is loaded with bryophytes consider visiting Puerto Williams on the Island of Navarino. A unique piece of traveling to the end of the world is a 30 hour ferry that takes you from the mainland to the island. On the trip nature abounds. Whales, birds, and glaciers are just a few of the amazing sites to see! While there I also went on a spectacular 5-day backpacking trip on the island (Dientes Circuit). It was an intense hike through sunny hot valleys, up an over cold windy passes, skiing down mountains on loose rocks, and slogging through piles of mud. A fabulous way to escape civilization and interact with nature! For nature lovers who are not adventure seeking backpackers, the Omora Ethanobotanical Park is a wonderful natural spot that has beautiful plant and bird life. There is a interpretive trail that introduces you to the common bryophytes of the area. Additionally there are even several pairs of Magellanic woodpeckers that live in the park and researchers are actively studying. I went out to try and see them a couple of mornings but no luck. I think this means I will have to go back to southern Chile to add them to my birding life-list! 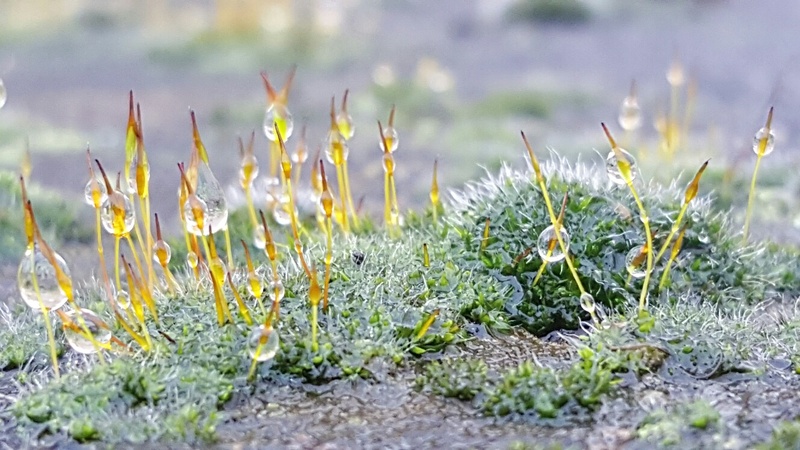 Bryophytes are one of the most important components of high latitude floras in terms of diversity, abundance, and ecological function playing key roles in primary succession, water retention, terrestrial carbon sequestration, and nutrient cycling. At high latitudes bryophytes contribute disproportionately to regional biodiversity, with the Antarctic flora composed almost entirely of bryophytes, and the southernmost tip of the Americas hosting 5% of the world bryophyte diversity on just 0.01% of the earths terrestrial surface. 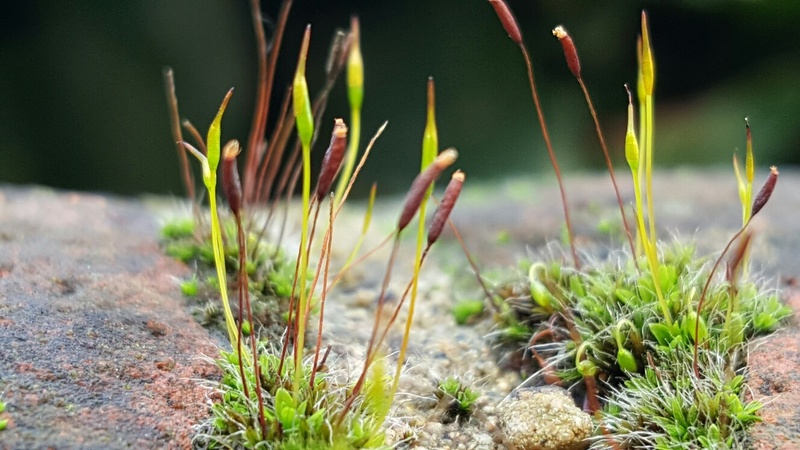 Over the last decade, molecular tools have dramatically shifted paradigms of bryophyte evolution, ecology, and biogeography both globally and in the Southern Hemisphere. Here we bring together cutting edge research on bryophyte phylogeography and ecology in order to highlight the key processes driving diversification, richness, and biogeography of bryophytes across ecosystems and timescales in the Southern Hemisphere. moss foray in the San Bernardino mountains. 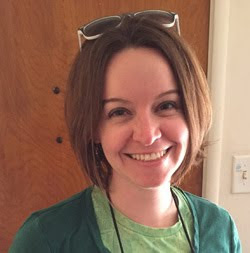 I am a Assistant Professor in the Department of Ecology and Evolutionary Biology at the University of Tenneseee - Knoxville. My research focuses on moss plants. Why Postdoctoral Researchers Join a Union. Why are moss plants so short?